I read this article in the Huffington Post Science and want to share it with you as it’s an excellent insight to the mind of a Narcissist. Author of the piece is Scott Barry Kaufman . He is scientific director of the Imagination Institute in the Positive Psychology Center at the University of Pennsylvania and he teaches an undergraduate course Introduction to Positive Psychology. 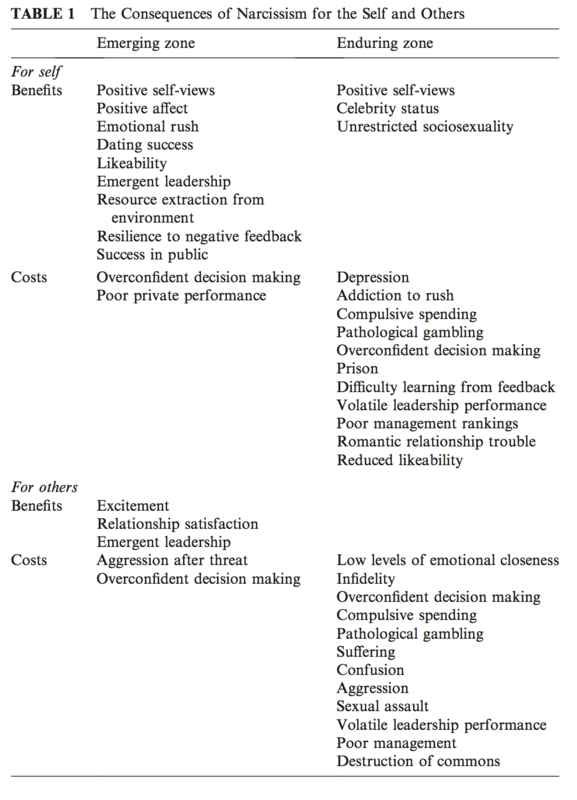 On the other hand, research shows that the initial popularity of narcissists at the early stages of interpersonal interactions depends on the behavioral pathway that is triggered: expressive and dominant behaviors are associated with a positive evaluation, whereas arrogant and combative behaviors are associated with a negative evaluation. According to this research, narcissists may be more popular at first acquaintance because they are more likely to display behaviors that trigger a positive pathway, perhaps because they are trying to make a good first impression. In line with this idea, W. Keith Campbell and Stacy Campbell proposed a new model of narcissism in which they argue that two particular time points are important. The “emerging zone” includes situations involving unacquainted individuals, early-stage relationships, and short-term contexts. In contrast, the “enduring zone” involves situations involving acquainted individuals, continuing relationships, and long-term consequences. A landmark study by Delroy Paulhus (an expert on dark personalities) supports this model. Paulhus brought strangers together to engage in weekly 20-minute group discussion over a period of seven weeks. They had people rate how they perceived others in the group after week one and then again at the last session (after seven weeks). He found that narcissism was initially related to positive evaluations, such as “assertive”, “confident”, “entertaining”, “exciting”, and “intelligent”. Seven weeks later, however, the same narcissists were evaluated much more negatively, receiving much higher ratings on characteristics such as “arrogant”, “tendency to brag”, and “hostile”. These findings provided some of the first evidence for narcissists’ declining popularity in social groups. But the question still remained: why the loss in popularity? To get to the bottom of this mystery, Mitja Back and colleagues recently conducted a study in which they tracked changes in popularity over several time points. They drew on their new theory of narcissism, called the “Narcissistic Admiration and Rivalry Concept“. According to their theory, narcissists’ overarching goal of maintaining a grandiose self is pursued by 2 separate pathways: narcissistic admiration (assertive self-enhancement) and narcissistic rivalry (antagonistic self-protection). Despite being positively related to each other, these two different components of narcissism differentially predict interpersonal orientations, reactions to transgressions in friendships and romantic relationships, interpersonal perceptions during group interactions, and observed behaviors in experimental observations. Adopting this framework, the researchers had 311 college students engage in tasks with increasing levels of intimacy and self-disclosure. Participants first introduced themselves and later engaged in tasks requiring them to work together as a team and, finally, played a game in which they discussed each other’s personalities. Over a period of just three weeks, the researchers found that the association of narcissism with popularity among peers became more and more negative. But they didn’t stop there. They were also able to pinpoint the cause of this loss in popularity. Narcissistic admiration explained initial popularity, while a decrease in narcissistic admiration and an increase in narcissistic rivalry over time was responsible for the decline in popularity. By the end of a three week period and several social interactions, narcissists were regarded as untrustworthy by their peers. There are huge implications here for interpersonal relationships. Research shows that people make decisions within the first few minutes of a relationship that determine the long-term nature of the relationship. While narcissists tend to win during that “emerging zone”, narcissists have been found to report less commitment in ongoing romantic relationships and higher numbers of marriages and subsequent divorces. W. Keith Campbell has found that relationships with narcissists tend to show a dramatic decline after just four months. So my advice for those who are dating is to look beyond initial superficial appearances and behaviors, and really see the person in multiple contexts first before you decide to take the relationship to the next level with a person. Particular contexts trigger either the positive or negative pathway in narcissists. A great test for the negative pathway is whether the person gets really agressive after their ego is threatened in any way. Also, I wouldn’t recommend trying to change the behavior of a narcissist you are dating. Erika Carlson and colleagues found that narcissists are perfectly aware that others see them less positively than they see themselves. They actually have rather good insight into the fact that they make positive first impressions that deteriorate over time, and they even describe themselves as “arrogant”, often being proud of it (seeing it as a sign of courage)! Truth is, narcissists aren’t insecure “deep down” on everything. Narcissists really do have high self-esteem for agentic-related traits (e.g., assertiveness, intelligence, attractiveness, social status, etc.) but have only average self-esteem for communal values such as intimacy and affiliation. These relationship issues don’t just apply to grandiose narcissism, by the way. For instance, a recent study found that neuroticism wasn’t detected at first acquaintance either, but was only observable in stressful situations. Likewise, a quieter form of narcissism called “vulnerable narcissism” tends to not be detected at first. 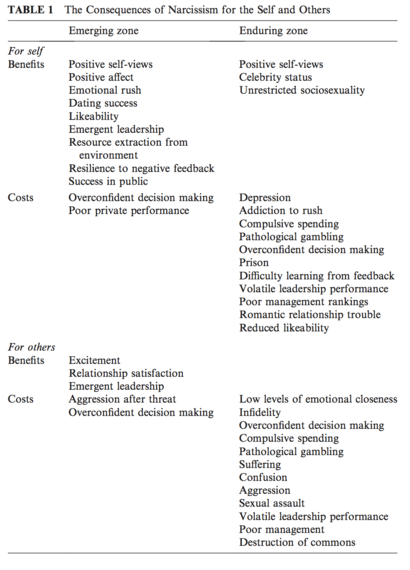 Joshua Miller and W. Keith Campbell found that vulnerable narcissism is an emotionally unstable, negative-affect-laden, and introverted variant of narcissism whereas grandiose narcissism (the kind of narcissism studied in the experiments documented in this post) is an emotionally resilient, extraverted form of narcissism. Kelly Dickinson and Aaron Pincus found that grandiose narcissism is associated with dramatic traits including histrionic personality disorders. Grandiose narcissists denied interpersonal distress relating to their interpersonal problems and they reported adult attachment styles reflective of positive self-representations (e.g., secure). Vulnerable narcissists, in contrast, reported high interpersonal distress and greater domineering, controlling, vindictive, cold, and socially avoidant interpersonal problems. Their adult attachment styles were reflective of negative self-representations (fearful, preoccupied). So while grandiose narcissism may be easier to detect, vulnerable narcissism may take even more time to reveal itself (see here for a great study showing that while grandiose and vulnerable narcissism are associated with antogonism and entitlement, they differ in terms of personality, interpersonal behavior, and psychopathology). Another implication of this research is for the narcissists themselves. What narcissists often don’t realize is that their behaviors are self-sabotaging. Because they are so addicted to the emerging zone, they often don’t see how their behaviors are making it nearly impossible that they will ever gain the deep social and emotional well-being rewards of being in an intimate, close relationship. Perhaps clinicians working with narcissists can help them tone down their narcissistic rivalry traits while keeping the more adaptive and ‘brighter’ aspects of their personality. At any rate, I’m really happy to see this line of research. Recently, Mitja Back and Simine Vazire called for a tighter integration between personality and the social realm. They argue that little attention has been paid to the complex dynamic processes that might explain the links between personality and social outcomes, and they invite researchers to embrace a more collaborative scientific approach to better understand the social consequences of personality. I couldn’t agree more. After all, research shows that the accuracy of first impressions matter. The more accurate we are, the better our future interactions, the more we like the person, and the more we are interested in future interactions with that person. Hopefully more research will help us better understand the varieties of human behaviors, what they mean in terms of underlying personality dispositions, and how we can use this information to form happy and healthy relationships. Note: For more on the paradoxes of narcissism, see my article “How to Spot a Narcissist“. * Most troubling, the facet of narcissism that most strongly predicted popularity at first acquaintance was “exploitativeness/entitlement”. This facet was the strongest correlate of all four cues, and was most strongly related to popularity. What’s more, those high in exploitativeness/entitlement were the most likely to dislike everyone else, even though they themsevles were rated as the most popular! About Me: Founder of On The Edge: This blog site shares professional and personal information, and support on Emotional Abuse. If you would like to subscribe you can do so here: Your details will not be shared. This entry was posted in After Posts, Uncategorized. Previous Post Previous post: Athens, Photos, Freedom, and Insight. Next Post Next post: The mind in motion- TEDxGalway.